So let me start by telling you about a meal. The training was held in a beautiful retirement complex in suburban Detroit. The walk from the parking lot to the clubhouse where we were meeting was through a stretch of prairie grassland. The windows of our room looked out on an artfully maintained pond and wetland. Every part of the place was carefully designed and constructed. 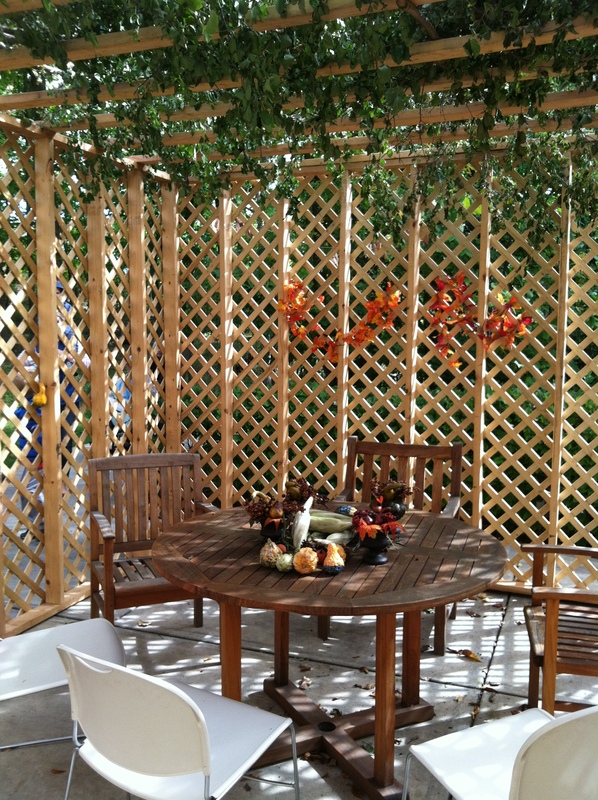 The sukkah — complete with conference room chairs. Except for the gazebo I raced past every morning. A mix of exhaustion, a strange location and “where can I get a decent cup of coffee” meant I was late every morning. And every morning I raced past the gazebo just outside the front door. It seemed oddly close to the door, given all the space they had, but I have a poor sense of design. It also seemed rather cheaply constructed, especially compared to the rest of the complex. It was seemed to be made of flimsy unpainted sheets of lattice from Home Depot and decorated with “previously alive” plants. But, since that pretty much describes my front porch right now, I didn’t feel it was my place to judge. Besides, I was late. That was all the thought I gave it until one lunch when I was invited to join a small group who were eating lunch there. It was the kind of autumn day I can only describe as stunning. A bit cool, enough breeze to rattle the leaves, a bright sun making everything glow. As our meal wound down and we headed back, one of our fellow participants mentioned this humble structure was a sukkah, a temporary hut built to celebrate the Jewish harvest festival. Nearly everything I know about Jewish holidays I learned from wrangling invitations from my small, eclectic group of Jewish friends. I had heard of Sukkot, but had never experienced it. Staci was generous enough to share a couple of the traditional blessings in both Hebrew and English. Blessed are You, Eternal our God, Sovereign of all: for giving us life, sustaining us, and enabling us to reach this season. What an amazing thing to be able stop, wherever you are, whatever your circumstances, and give thanks for being brought there. I knew I needed to give thanks for having been brought to that temporary gazebo on that beautiful fall day in a place I never imagined I would be. As I have mentioned, I wasn’t “supposed” to be in that training. The plan was for me to attend one of the rare ones held just a few minutes from my home. But I screwed up the scheduling and missed the first two days. So I got transferred to this session. I was reluctant to make travel and lodging plans, because every moment of planning was tinged with guilt. I only have to take this extra time and spend this extra money – money I don’t have – because I screwed up. But, armed with encouragement from loved ones, I pushed through and ahead. Then when the day came to fly to Detroit, weather in Chicago kept us sitting on the tarmac in Minneapolis for an hour and a half. And then trapped me in O’Hare airport for 7 hours. As I dragged my suitcase from gate to gate, chasing delayed flight after delayed flight I developed a mantra: I shouldn’t be here. This is a sign. I shouldn’t be here. This is a sign. That’s not my normal mode of thinking and it was too late now, anyway, so I struggled to make peace with reality (like I had any shot at winning) and find some calm. At last, sitting a row of seats by the recharging station, I let go and actually started to get excited about the trip. I had a very nice note from a woman back home. I had contacted her two years ago about enneagram training and she was just letting me know she was holding a training in a few weeks. Just a few minutes from my house. She sure hoped I could come. I shouldn’t be here. This is a sign. I shouldn’t be here. This is a sign. Sometimes the best thing you can do for inner peace is close your email and pretend it never happened. The rest of the story is short and sweet and still unfolding. I caught a 10 pm flight to Detroit. Checked into my hotel at 1:00 am. Meet a fellow participant over hotel breakfast. Caught a ride with her to the training. During opening circle shared my story and said my goal for the training was to know that I belonged there. I learned mind-blowing things about myself and the people I love in the following sessions. I met and bonded with some amazing people. I’ve starting playing with using the enneagram to help writers get started and keep going. I have started working with a couple writers. I am recognizing my own blocks and finding ways through them. And if that wasn’t enough to tell me I was supposed to be there, nearly every person there, 30-some of them, made a point of telling me I belonged there, with them, in that place and that moment. So I as I left the sukkah that afternoon, I gave thanks for being brought there. And right now, I give thanks for being brought to this increasing busy coffee shop, where I can listen to Goldfinger played on violin and Hawaiian guitar and update my blog and write deep thoughts. I give thanks for this moment, perfect and complete in all its complexity. This entry was tagged deep thoughts, Enneagram, gratitude. Bookmark the permalink.